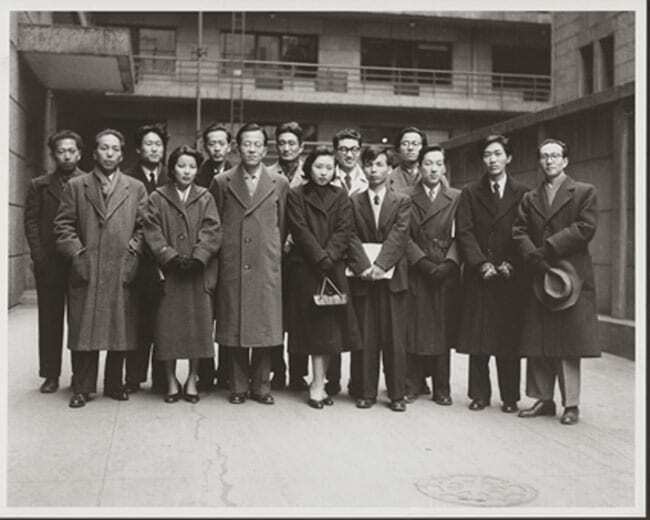 Group photograph of Jikken Kōbō, 1954 (photograph © Kitadai Shōzō, provided by Taro Okamoto Museum of Art, Kawasaki)Left to right: Ōtsuji Kiyoji, Takiguchi Shūzō (critic), Akiyama Kuniharu, Mrs. Sonoda Takahiro, Yamaguchi Katsuhiro, Sonoda Takahiro, Komai Tetsurō, Fukushima Hideko, Fukushima Kazuo, Takemitsu Tōru, Imai Naoji, Yuasa Jōji, Suzuki Hiroyoshi, Satō Keijirō. Doryun Chong: Tell me how your work on Jikken Kōbō [Experimental Workshop] started. Miwako Tezuka: I specialize in contemporary Japanese art, which basically means post-1945. While doing some ground research, I realized that in the history of post-1945 Japanese art, most research was done on Gutai in the 1950s in the Kansai area, the western region of Japan, and I noticed this gap on the activities in Tokyo. In academic research on arts and cultures, perhaps there’s a tendency to focus on what’s happening outside the center, which of course is Tokyo in the case of Japan. Maybe that’s part of the reason people started talking more about Gutai, and another reason is that there were many materials available on Gutai for international scholars. So there was quite a bit more on Gutai already when I started the research. Chong: Not that there were that many in this country who focused on Gutai. You can count them on one hand. Tezuka: But when you talk about Jikken Kōbō, there were definitely not that many people, even in Japan. So I saw that gap, and since I’m from the Tokyo area, I felt more comfortable. I knew from my contacts people who were involved or had archival materials. I was interested in interviewing them and having access to the primary materials. Chong: This was the early 2000s? Tezuka: Yes, and I also did background research in the late 1990s to see if it was even plausible to do research on the scale required for a dissertation. So I met with critics and artists active at the time to test the water, so to speak. Chong: But by the time you started the research in earnest, most of the artists were no longer living. Tezuka: Most of the artists were gone, including [musicologist and critic] Akiyama Kuniharu, [composer] Takemitsu Tōru, and [composer] Suzuki Hiroyoshi, who was most vocal about the influence of Eastern philosophy on Jikken Kōbō. Ōtsuji Kiyoji was still alive—but others with whom I would’ve loved to speak were gone. Chong: But Kitadai Shōzō was still alive? Tezuka: Yes, Kitadai was still alive, and I did two extensive interviews with him. I did a long interview with Yamaguchi Katsuhiro, and I also met with Ōtsuji Kiyoji and with Imai Naoji. Chong: Imai is still healthy and active, I hear. 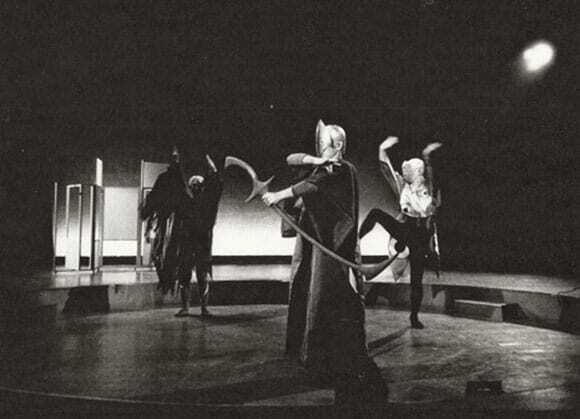 Tezuka: Yes, he’s still doing lighting design for theaters. I actually met with him at the Sōgetsu Art Center as he was working on lighting. And I also met with Fukushima Kazuo, who is still teaching literature. Who else? From the former members of Jikken Kōbō, also Yuasa Jōji. Chong: That’s pretty good, in terms of having a direct access to the original members. So from this experience what did you gather? Tezuka: I discovered that a lot of archival materials had not been given to public institutions, which meant they were not readily available to scholars. Especially, Mr. Kitadai had a lot. Chong: So this was before his materials ended up at the Okamoto Taro Memorial Museum [in Kawasaki]. Tezuka: Yes, he had most of them at his home, where I went through them. Also Mr. Yamaguchi had a lot of records, which now belong to his own foundation—the Institute of Environmental Art and Design. But it was also the time when museums in Japan were just getting interested in these archival materials from the 1950s and 1960s and getting in touch with the artists about donations. Sometimes, for instance in the case of Fukushima Hideko, I wasn’t able to see the materials, because she had already passed away, and the family was in conversation with different institutions for possible donation. Those materials are now available, but I’m not quite sure where they are at the moment. Chong: My impression from visiting various museums is that works and materials from these artists are well represented in a number of institutions, and the curators in these places are fairly knowledgeable and interested. Perhaps, however, that wasn’t the case when you were doing your research. Tezuka: Not at that time. Chong: To do this, did you have any trouble convincing your dissertation committee members and academic colleagues? Tezuka: Surprisingly, no. They were very supportive. At that time no one was teaching modern or contemporary Japanese art, so I had a kind of patchwork of a committee: Benjamin Buchloh, from postwar Euro-American art history and criticism; Henry Smith, modern Japanese history; Miyeko Murase, Melanie Trede, and Melissa McCormick in traditional Japanese art history; and Esther Pasztory, professor of Precolumbian art history, who in the late 1990s was encouraging students to look toward multiple modernisms in her series of seminar on modernisms outside the West—it’s relatively common now, but at the time it was groundbreaking. Chong: Even though they knew nothing about your topic per se. Tezuka: Yes, but they could contribute their comparative perspectives. They were all very supportive, but I had to do a lot on my own. Chong: So what did you have to do? Of course you had to do archival research, but you also had to justify it and contextualize it as an important avant-garde movement. Tezuka: When it comes to Jikken Kōbō, if you only see the surface of their work, it’s quite similar to prewar avant-garde art in terms of its look. So for those with no information, it may seem imitative. But I knew that when they were working in the immediate postwar years, it meant something different, and I wanted to focus on what it meant to the artists from the Japanese perspective. So I focused on laying out the sociocultural situation in postwar Japan in the 1950s; how the American Occupation left its mark on Japan right after the war. This situation was very distinct from what Japan was like in prewar years, when it was much more oriented to Europe. I needed to make clear this contextual change and then place the activities of Jikken Kōbō in that milieu. Chong: Would the introduction of music of Arnold Schoenberg to Japan via the American composer John Cage be an example of this? Tezuka: I know that it happened kind of organically for them, rather than consciously. Information became available to them mainly through the library of CIE (Civil Information and Education section) set up by the Allied Occupation authority. Chong: Through the United States Information Service? Tezuka: It was the predecessor to the American Centers in the post-Occupation years. I found out through interviews that the artists were getting a lot of information through that. When I presented this discovery to Benjamin Buchloh, he mentioned that the same thing happened in postwar Germany, and that information coming through American Centers strongly influenced the ideological change. This comparative point was part of the motivation for me to continue to pursue the research. Chong: When I think about Jikken Kōbō, on the one hand, the group is so different from many artists and artist groups that proliferated at the time in the sense that they were so apolitical. Tom Havens seems to emphasize that.1 But when you think about artists who were more politically oriented, more invested in proletarian politics, such as the young On Kawara and Ikeda Tatsuo, who were in fact younger than the Jikken Kōbō artists, I wonder why the group was so apolitical. Is it because they believed that aesthetics and politics shouldn’t mix, or does it have something to do with their class? On the other hand, they are in many ways such pioneers in interdisciplinarity and intermedia, well before “intermedia” became a key term in the late 1960s. In one of the essays Yamaguchi claims that there never was—not only in Japan but in the history of modernism in general—such a truly intermedia avant-garde. Part of me is incredulous, but part of me also wonders about that as well. I’d like to hear your thoughts on these two aspects of the group. Chong: Such as Yoru-no-kai (Night Society). Tezuka: Yes, Yoru-no-kai and also Seiki-no-kai (Century Society) and others. The Jikken Kōbō members before they came together as Jikken Kōbō attended such gatherings, as very young participants. They were very much influenced by older artists of these meetings, but at the same time they were sensing a gap, almost a difference of temperature. They did not feel that they were as politically engaged as older artists in their artistic activities. Both Kitadai and Yamaguchi said that they were there, but more as audience than as participants, which attests to their difference from slightly older artists. I haven’t done much research on this, but perhaps also their class background—solidly middle-class—meant that they were not as agitated as the older-generation artists, the war generation. So this had to do possibly with the relatively less political nature of their work. But I can’t really say this for sure. Chong: Do you feel that it’s a correct assessment to say that they were truly pioneers in cross-disciplinary and intermedia art, as Yamaguchi has said multiple times? Tezuka: I do think so, definitely for that time. The existence of musical composers especially made a huge difference. They were directly connected to the development of media—I’m of course not talking about the internet, but the developing new media of the time, such as radio and television. which were seeking new content. The broadcasting companies like NHK (Nippon Hōsō Kyōkai, Japan Broadcasting Corporation) were working a lot with musicians and artists to make interesting programs. This didn’t happen in artistic contexts, but for entertainment and news. So this provided access for musicians and artists to . . . devices for recording and editing, for instance, and opened their ideas to different technologies. Chong: Are there comparable examples outside Japan? Tezuka: Strangely, you have to wait until the 1960s when E.A.T. [Experiments in Art and Technology] comes around. And places like Channel 13 and . . .
Chong: WGBH also? But that’s much later isn’t it? The 1970s? Tezuka: Right. In Japan, because everything was destroyed, everyone had to work together. People got together from different areas to start everything and anything. Chong: And that created an environment in which artists could work with engineers. Weren’t Kitadai and Yamaguchi originally engineers? Tezuka: Kitadai was definitely interested in engineering. Yamaguchi was interested in such things as the mechanism of cameras, but initially studied law before he decided to become an artist. It was the necessity of the time for them to be multidisciplinary and multimedia. Chong: I guess this was also a precedent for, say, Nam June Paik and Abe Shūya developing the video synthesizer together later, circa 1963. Tezuka: Right, Jikken Kōbō was very hands-on and analogue, but they really started something new. I once had a conversation about this “open-source” approach with Sumitomo Fumihiko, the curator, who mentioned to me that, interestingly enough, in postwar Japan, the CIE library in Tokyo was the first open-stack library. It was where the occupying American forces centralized all the incoming information—music, magazines, books, etc.—for Japanese people to use for free. This was the first instance for a general audience to go to access new information. Before, there were no open-stack libraries. So Sumitomo thinks that this had a lot to do with Jikken Kōbō being able to develop such a multidisciplinary character and approach. Tezuka: Yes, in some ways, the sky was the limit. At first, though, it must have been really devastating. One thing I thought about a lot, when thinking about those images of Tokyo completely razed, is that these kids, when they were so hungry and should be searching for food, they were searching instead for information—about art from outside. There were two types of hunger—physical and intellectual. Chong: When thinking about people like Okamoto and Takiguchi Shūzō of the older, prewar generation who had immense knowledge and experience with Dada and Surrealism, they had to hold this information and keep it alive, if you will, through the oppressive war years. Okamoto was drafted, right? Tezuka: Yes, he was a POW somewhere near Xian in China and was repatriated only in 1946. Tezuka: Takiguchi was never drafted because his health wasn’t good. Chong: But he did get into trouble with the militarist government, no? Tezuka: Yes, in 1941, he was suspected of communist sympathies because he was a surrealist. This was the black-or-white way of thinking of the authorities at the time. If you’re a surrealist and interested in European avant-gardes, then you must be communist. Chong: In this environment, because artists were separated from the outside, the avant-garde ideas were kept intact or alive, while the European avant-gardes themselves had to evolve, right? They moved to the United States, or groups dissolved or got involved in infighting. In what forms Dada and surrealism survive, and in what ways did they affect the generation coming after the war? Tezuka: I don’t have an answer, but the time lapse certainly meant a reinterpretation for the generation following Okamoto Tarō, which didn’t experience the avant-gardes directly. There was a revival with the American Occupation. Chong: What do you mean by revival? Tezuka: The generation that was learning from Okamoto and Takiguchi—the information was sort of distant for them, but they had this new information coming from America. There is a really skewed timeline, the chronology here. Everything was happening at the same time for them. So it’s like the Meiji period [1868–1912] all over again, with an onslaught of isms. Chong: Just before they got hit by the new waves of Neo-Dada. Tezuka: [Laughter.] Yes, that happened very soon after. So just as American Neo-Dada was arriving in Japan . . .
Chong: . . . they had been catching up with information on all these trends that they had been missing. Tezuka: Right, but it’s very abstract to me, and I need to think about how this can be illustrated or substantiated. Chong: Now obviously we have a much more sophisticated or at least skeptical view with regard to information and influence—that just because one receives information about something from outside doesn’t necessarily mean that it constitutes an influence. Tezuka: In that sense, the “open source” view or approach is a really interesting one, with examples such as Jikken Kōbō. Chong: To change the topic a bit, could you say something about the state of the field of postwar Japanese art history since you did your research and wrote your dissertation? For one thing, with Reiko Tomii, you’re a cofounder of PoNJA-GenKon, the listserv for scholars and researchers in the field. Recently, I’ve read the work of scholars like William Marotti, who teaches history at UCLA and is coming out with a book that addresses artistic actions and political activism in the 1960s, including the artist group Hi Red Center, and also a dissertation on the 1950s social (sur)realist “reportage” painting by Justin Jesty from the University of Chicago. So there are in-depth studies of what might have been considered little-known and even obscure topics in history and art history of postwar Japan, which means that there’s something like multidimensionality building in this field. On the other hand, I have the impression that the field remains still quite small and underdeveloped. Tezuka: I wonder if it reflects the “new art history” approach since the late 1990s—in other words, there is no single narrative or approach. It’s difficult for students to see a particular part of history and state their own understandings. Chong: But does that explain the ambivalent state of twentieth-century Japanese art history in American academe? Tezuka: That perhaps has to do with the Japanese hesitancy to create a canon. I talk about that in my dissertation a bit; there are no canonical works in postwar Japanese art. Yes, [the critics] Chiba Shigeo and Haryū Ichirō tried in some ways, but they also didn’t claim that their narratives are in any way a definitive postwar Japanese art history. It was too early, first of all, and it’s almost like they didn’t want to be authorities. There still is no standard for understanding contemporary Japanese art history. So it’s still always [Alexandra Munroe’s exhibition catalogue] Japanese Art after 1945: Scream against the Sky. Chong: Now that you’re at a pan-Asian institution, the Asia Society Museum, and deal with all these different national art histories, do you think about them in relation to your research and scholarship into the 1950s in Japan and Jikken Kōbō? Tezuka: I do. Whenever I work on the art history of a different country, I compare it to that of Japan. Still amazing to me, the narratives are always different, even though the products may appear similar. There are a lot of invisible parts that people don’t see, and I guess that’s where the curator’s job lies. Chong: I don’t want this to sound like an invitation to merely compare and contrast, but there are interesting inquires to be made, even focusing just on art histories in Asia, because almost every nation has had its own history of disruptions. Obviously, Japan has the longest and most robust history of modern art in East Asia and also had a significant disruption. China had its own. If you look at Contemporary Chinese Art: Primary Documents, edited by Wu Hung and published by MoMA in 2009, its history doesn’t even start until 1976—the end of the Cultural Revolution and the beginning of contemporary art. South Korea, as expected, has its own pattern. . . . And connections between nations are quite important too. For instance, the foundation of Korean modern art was really laid by the Japanese, and there was a very close relationship between the two countries 1910 to 1945, and then a prolonged disruption because of the Korean War. But what happened afterward isn’t Jikken Kōbō, you know? There were other bridges between the two countries through figures like Lee Ufan and Nam June Paik. So one could say that the art histories of Japan and Korea converge and then diverge throughout the twentieth century. Even though China and Japan might not have as close a relationship, there are certainly certain parallels. We might talk about such connections on a micro level, via stories of individual encounters. Tezuka: There have been exhibitions or examinations of Tokyo and Berlin, or Tokyo and Paris; there could certainly be research about Tokyo-Seoul or the Tokyo-Shanghai nexus. Chong: I guess one good example is the recent exhibition Cubism in Asia, organized by the Japan Foundation, which toured Asia, and also to Paris. Then one could think about Dada and surrealism in Asia, because there’s definitely something there. Tezuka: Oh yes, definitely. I would love to do a show on surrealism in Asia—in Japan to start with. I would certainly love to think about an exhibition on Takiguchi Shūzō. Chong: That would be amazing. Well, you’re working for a good institution to do that! Miwako Tezuka is an associate curator at Asia Society in New York. A specialist in Asian contemporary art, she cocurated Yoshitomo Nara: Nobody’s Fool (2010) and curated U-Ram Choe: In Focus (2011), among many other exhibitions. She is also a cofounder of PoNJA-GenKon (Post-1945 Japanese Art Discussion Group), a global online network of over one hundred fifty specialists and students working in the field of contemporary Japanese art. Doryun Chong is associate curator of painting and sculpture at the Museum of Modern Art in New York. At MoMA, he has organized Bruce Nauman: DAYS (2010) and Projects 94: Henrik Olesen (2011). He is currently working on Tokyo 1955–1970, which will open in November 2012.